UPDATED: Sun., April 15, 2018, 7:47 p.m.
NEW YORK – Jackie Robinson’s daughter thinks black baseball players are more reluctant to speak publicly about racial issues than their NFL and NBA colleagues because they constitute a lower percentage of rosters. 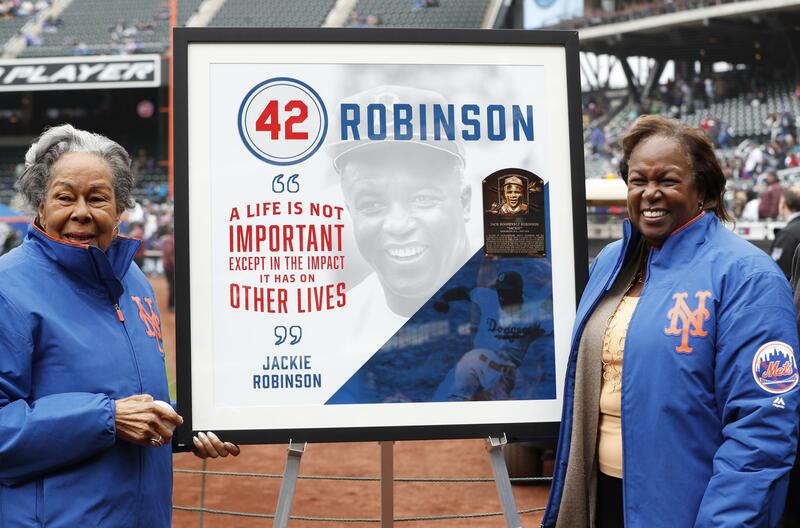 She spoke at Citi Field on Sunday to mark Jackie Robinson Day, the 71st anniversary of her father breaking Major League Baseball’s color barrier with the Brooklyn Dodgers. The percentage of black players from the United States and Canada on opening-day active rosters rose to 8.4 percent, up from 7.7 last year and its highest level since at least 2012. An educational consultant to Major League Baseball, Sharon Robinson attended the first-pitch ceremony before the Mets-Milwaukee game with her mom, 95-year-old Rachel Robinson, and brother David. On a chilly afternoon, the game time temperature was 42. Edward Robinson, a son of Jackie’s brother Mack, attended the Los Angeles Dodgers’ game against Arizona and wouldn’t address Sharon Robinson’s comments. Published: April 15, 2018, 5 p.m. Updated: April 15, 2018, 7:47 p.m.